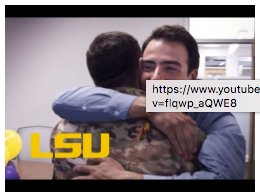 When your brother is in Afghanistan with the U.S. Army National Guard and your mom lives in Colombia, you don’t expect to see them in your engineering building, but Wednesday was no ordinary day for LSU student John Estrada. Estrada was in class on Tuesday when it was interrupted. He was told he was needed in a meeting. But he soon learned that “meeting” was actually a surprise. Waiting with open arms was his brother, on leave from Afghanistan, and his mother, visiting from Colombia. They grew up in Colombia. John Estrada is an LSU graduate student, studying petroleum engineering. John’s brother, Harold Estrada, is a specialist in the U.S. Army National Guard. He has been serving for more than four years. After serving in different countries including Germany and Kuwait, he landed in Afghanistan in October 2016. He deployed with the 7th Finance Management Support Detachment assigned to the 369th sustainment brigade, running operations under the supervision of the 1st Cavalry Division. His home base was Afghanistan, at Kandahar Air Field, but he also supported operations on more than five bases all over Afghanistan including Bagram, Shorab, Mazar-e Sharif, Herat, and other with undisclosable name and location. He is currently on leave. Their mother still lives in Colombia.